The transit (moving) Sun travels fairly quickly, spending almost one month in each sign. The aspects it makes last for about two days, the day before and day of. The transit Sun can show variances in your personality. 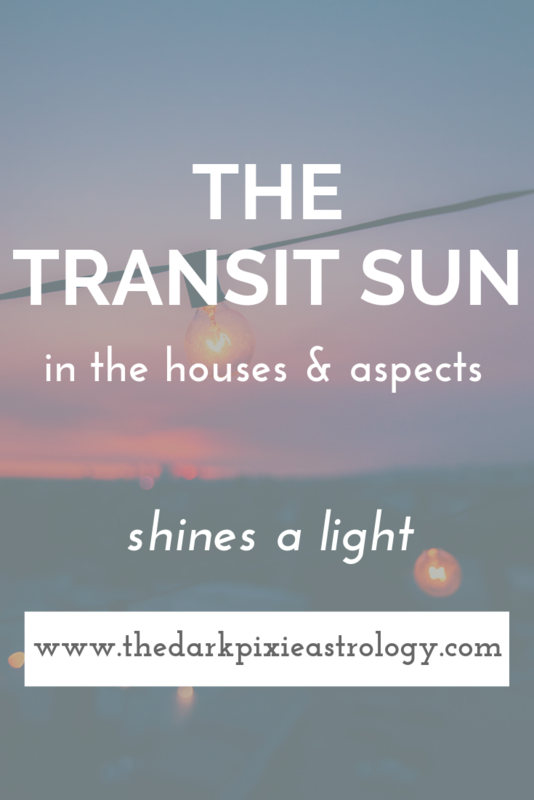 With the transit Sun in your 1st house, your focus is on you. You can work on your appearance, make changes in the way you behave with others, and need to express yourself in some way. You want attention more than usual, wanting to be in the spotlight. It’s a good time to start something new in your life, especially going down a new path. You’re more independent, but also self-centered, but that doesn’t have to be a bad thing. You need to focus on yourself every once in a while. You’re more confident, bold, and daring, and you’re willing to go out and take what you want without waiting for anyone’s permission or help. With the transit Sun in your 3rd house, your focus is on communicating. Your mind is more active, you have more ideas and thoughts, and you want people to hear what you have to say. You’re more social, so this can be a good time to make connections. You want to stay busy, and can take on many tasks, but usually smaller ones that can be completed quickly. You’ll have trouble with anything long-term because your concentration isn’t great, and you’re a little scatterbrained. You keep your schedule packed, and this can be a good time for some short trips. You may want to learn something new, or are more curious about the way things work. With the transit Sun in your 4th house, your focus is on your home and family. You may do something new to your home to spruce it up, buy or sell a home, move, or fix something. You could do more with your family, spending more time with them than working or being social, and can have family outings or get-togethers at home. You want to feel as though you have a solid home base, a place that’s comfortable and where you feel secure, and that you’re connected to your family. You can work on building up your inner foundation and getting in touch with your emotions. It’s also good for planning long-term projects. With transit Sun in your 5th house, your focus is on fun. You don’t want to sit around, work, or deal with serious issues. Engage in your favorite hobbies, go out with friends, attend parties, and go on dates. You’re a little more daring and a lot more enthusiastic about life. You seem more friendly and outgoing, and you come across as warm and funny. You want attention, and you can get it. You may be a little more dramatic and theatrical with your behavior, but you’re just living life to the fullest right now, experiencing and enjoying as much as you can, and you want everyone to get in on it with you so you have company. With the transit Sun in your 6th house, your focus is on work. It’s not the time for play and silliness. You can get through work projects easily because you’re more focused and pay attention to the details. This is an excellent time for getting done smaller projects, but not the larger ones since you’ll have a harder time dealing with the big picture. You can deal with your day-to-day affairs, the mundane tasks of life that most of us shun, and make improvements to your routine, as well as your health. You’re better at working by yourself but for others rather than starting things up on your own. You can come across as more analytical, distant, and a bit of a perfectionist. You could also deal with or get a pet. With the transit Sun in your 7th house, your focus is on other people and your relationships. It’s less about you and more about them. You work better with a partner, and feel better when you’re with someone in a one-on-one setting. You can have a hard time doing anything alone or being in a crowd. You want to make improvements to your relationships and become more committed. You come across as more charming, mediating, and can make compromises happen. You’re also concerned with balance, and try to strike the perfect balance in your life, so if you’ve been spending a lot of time on work, you’ll spend more time playing, and try to balance the scales. With the transit Sun in your 8th house, your focus is on transforming some part of your life. You’re not satisfied with leaving things the way that they are, and want to make something better. This could be some aspect of your life, personality, or even a physical object. You spend more time by yourself reflecting on life, and seem more serious, brooding, and emotional. Your emotions can sway between extremes, and you may hold a lot in and be secretive. You’re excellent at researching now, and can dig below the surface of anything to get to the heart of the matter. You can also deal with your joint finances, financial partnerships, debts, loans, taxes, and inheritances. With the transit Sun in your 9th house, your focus is on expanding your world. You want to have experiences that open you up to the other ways in which people live, and give you greater perspective. You may spend time with people who are from different countries, cultures, and backgrounds from yourself. This is a good time to learn something new, study philosophy, or go back to school. You identify more with your beliefs, and love to have a lively debate about it with people. You’re more outspoken and willing to voice your opinions. You have an easier time dealing with the big picture, but have a harder time with daily life. You’re more honest, blunt almost, and might stick your foot in your mouth. With the transit Sun in your 10th house, your focus is on the direction your life is taking and your goals. You want to take a look at how your life is unfolding and where you’re going in life, and determine whether or not you’re going in the direction that you want to be going in. You want to accomplish a goal, and are more hard-working and sacrificing to get it. You take a more practical approach to life, and have to deal with bosses, parents, mentors, or other elders. You’re recognized for work that you’ve done, and can be praised, or you can be punished if you haven’t been behaving right or smart. It’s a time to be responsible and mature. With the transit Sun in your 11th house, your focus is on independence and the future. You want to do things in groups, spend time with friends, and are quite sociable, but you don’t actually need any of them, and don’t want to feel tied down to anyone or anything. You keep yourself somewhat at a distance from people and don’t want to deal with emotional drama. You concentrate more on your future, what your dream future would look like, and what your hopes are. You have a better grasp on what you want your future to be, and can formulate ideas of what your ultimate aspirations are. You’re also more of a humanitarian now, and want to help the world as a whole, so you may get involved in a cause. You’re attracted to the unconventional, and don’t want to be put in a box. With the transit Sun in your 12th house, your focus is on your subconscious and letting go. Old issues can come up that you need to face and move on from. This is a good time to get rid of baggage, and clear your life physically, mentally, emotionally, or spiritually. There’s always something that you can get rid of. You may feel drained, especially around people, and need to spend more time alone to recharge. You don’t want to be in the spotlight, and prefer to stay in the background and not get any attention from people. You may seem more sensitive and emotional, require more rest, and are more intuitive. You’re also more compassionate, and you want to help people who can’t help themselves. With transit Sun conjunct your natal Sun, you have your solar return, when the transit Sun returns to the exact position it was at when you were born, and you should do something just for yourself. It’s a new time for you to start something big for the next year, and you can have energy, drive, and focus. With transit Sun sextile or trine your natal Sun, you can express yourself more easily and feel more confident than usual. You could be recognized for something that you’ve done. Your energy and vitality is strong, as is your will. With transit Sun square or opposite your natal Sun, whatever you want to make happen is more difficult. You can experience opposition or issues that cause tension and challenge you, but you could learn from them. Also watch your physical body because you’re more likely to feel sick, lethargic, or be injured. With transit Sun conjunct your natal Moon, you feel at one with your emotions, which can make you feel more self-assured with yourself and your direction. Your home is especially good for you now, making you feel more in sync. You’re enthusiastic about life, and it’s a good time to start something new that can be worked on over the next few weeks. With transit Sun sextile or trine your natal Moon, new prospects may be presented to you that you can deal with well. You can hone your energy on whatever it is you need to get done. Physically, you have more strength, stamina, and feel healthier. You can increase the quality of your relationships with this aspect. With transit Sun square or opposite your natal Moon, you can be impulsive, doing things without thinking. You may work hard without seeing results, making you frustrated. Trying something new isn’t favorable during these few days. You may not be clear about your feelings, and this can bring problems or start a fight in a relationship. Physically, you’re not up to par, and can feel weaker, sick, or tired. Stress can increase. You can try to deal with this energy by recognizing your emotions and not letting them override logic. With transit Sun conjunct natal Mercury, your mind works faster than usual, and you don’t have to take the time to think things through because it happens instantly. You may need to adapt to a situation, are more honest, and have a lot to say, but have a hard time listening. With transit Sun sextile or trine natal Mercury, your mind is open to learning, and you have an easier time dealing with smaller tasks and the details. You can share what you think and people will listen. With transit Sun square or opposite natal Mercury, you may have a lot to do, or are too scatterbrained to get through much. You can have a hard time dealing with your emotions, could have a fight or misunderstanding with someone, or feel anxious and nervous. With transit Sun conjunct natal Venus, you can be creative and desire attention and affection. You try to be graceful and charming, and need to be around people. It’s a good time to improve your physical appearance, go to a social function, have a date, and be romantic. With transit Sun sextile or trine natal Venus, you enjoy being around people, and come across as more charming and attractive. You can be a good mediator, and have an easier time dealing with your finances. With transit Sun square or opposite natal Venus, you may want something that you don’t or can’t have, and you could spend on something you don’t need and regret it later. You can feel as if people are taking you for granted or that you’re lonely. You’re lazier than usual and can overindulge. With transit Sun conjunct natal Mars, you want to get thing started now and won’t wait for anyone. You’re pioneering, assertive, and go for exactly what you want. Your energy is high, and if you don’t find an outlet for it, you’ll become cranky, argumentative, and aggressive. With transit Sun sextile or trine natal Mars, you can stand up for yourself without running over someone else. You can get things started, but not force the issue if you shouldn’t. You’re enthusiastic and energetic, and you feel strong and confident. With transit Sun square or opposite natal Mars, you feel restless, and your energy is either too high or too low. You’re easily frustrated, and find yourself fighting with people. You need to find an outlet to direct your energy towards so you can channel it into something positive. With transit Sun conjunct natal Jupiter, you feel confident and optimistic. You want to expand your life in some way, or experience something that will let you see the world in a new way. You care for others, and you’re easy to be around. You can make improvements to yourself or life, or have something come to fruition. With transit Sun sextile or trine natal Jupiter, you’re good with people and can get them on your side. You want to make your life better in some way, have a positive outlook, and feel more daring. With transit Sun square or opposite natal Jupiter, you may want more out of life than you have right now. You can be overly optimistic and impractical, indulgent and excessive. If you can try to stay in touch with reality and work with it, you can use the energy well. With transit Sun conjunct natal Saturn, you’re in touch with reality far more than usual. It’s a good time for self-discipline and control, as well as being hard-working, though you may demand too much of yourself. Continue work on projects you’ve already started. You’re responsible and should manage your time well. With transit Sun sextile or trine natal Saturn, you have a serious approach to life, and you can begin a new project that takes time and effort. You’re not in any rush to get things done. You have an easier time dealing with parents, bosses, mentors, and other elders. With transit Sun square or opposite natal Saturn, you may feel insecure and question yourself too much, or feel neglected and alone. Confidence is lacking, obstacles block your way, and reality hits you over the head with a brick. If you can avoid getting too down about yourself or life, you can be more responsible. With transit Sun conjunct natal Uranus, you feel independent and want to make a change in your life. You don’t want to leave things the way that they are, and want to try something completely different. If you can’t do anything different, you feel restless and agitated. Something unexpected could happen. With transit Sun sextile or trine natal Uranus, you seem a little quirky. You want to be unique, your own person, and not follow the crowd. You take an innovative approach to situations. You can do something new that feels like a breath of fresh air. With transit Sun square or opposite natal Uranus, things can happen out of the blue that you’re not prepared for and throw you off. You can feel impatient. You don’t want to be like everyone else, and resist conformity. It’s up to you to accept the changes that come, because they’re usually to your benefit. With transit Sun conjunct natal Neptune, you’re more sensitive than usual, as well as more intuitive and creative. You can have a hard time with reality, and can act like a victim, try to escape, or have a hard time understanding things. With transit Sun sextile or trine natal Neptune, your imagination is active, and you’re inspired to create something. You want to help people who can’t help themselves, and feel compassionate. Your intuition is good. With transit Sun square or opposite natal Neptune, your energy can be low, physically, mentally, emotionally, or spiritually. You can experience a setback. You have a hard time focusing on anything. It’s better to deal with creative things, and get lost in fantasy. With transit Sun conjunct natal Pluto, you want to have more control. You can have the opportunity to increase your personal power, and you’re more likely to keep things to yourself, or discover a secret or mystery. With transit Sun sextile or trine natal Pluto, you’re researching and can dig below the surface. You can focus well, and are driven to gain more power in your life. It’s a good time to deal with finances. With transit Sun square or opposite natal Pluto, you may try to exert power over other people. You can be manipulative or controlling. You may have a hard time accepting things as they are, and push too much. You can fight against obstacles well, and find power deep inside of yourself.